There has been a lot of media attention around the coral reef disease in Key Largo. We thought you would like to know how we have become involved! Recently we helped inspect the antibiotic putty that have placed on coral heads on the Key Largo reef tract. The treatment is experimental at present and has been placed on around 60 coral heads from Carysfort to Molasses reef. You can easily spot the treatments as each has a placard with a number on it and a website to contact. 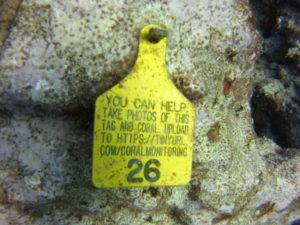 NOVA Southeastern University is encouraging divers to take photographs for the coral head and the relevant placard and the to load it onto their website. This will help NOVA to monitor the effect of the remedy. 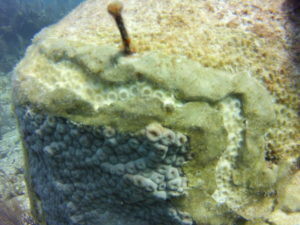 You can see the antibiotic paste holding the diseased coral at bay here. Want to be part of the monitoring? If you would like to visit some of these coral heads lets us know and you can be part of the solution!